Dante's Peak is a 1997 American disaster thriller film directed by Roger Donaldson. 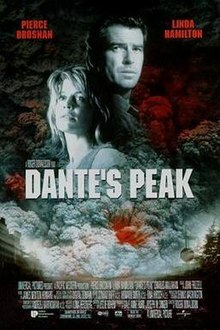 Starring Pierce Brosnan, Linda Hamilton, Charles Hallahan, Elizabeth Hoffman, Jamie Renée Smith, Jeremy Foley and Grant Heslov, the film is set in the fictional town of Dante's Peak where the inhabitants fight to survive a volcanic eruption. The film was released on February 7, 1997, under the production of Universal Pictures and Pacific Western Productions. In 1993, USGS volcanologist Dr. Harry Dalton and his partner, Marianne, attempt to escape an eruption in Colombia. She dies when a volcanic bomb lands through the roof of their truck and hits her in the head, leaving Harry devastated. Four years later, Harry is assigned by his superior, Dr. Paul Dreyfus, to investigate seismic activity near Dante's Peak, Washington, a town that borders a dormant stratovolcano. Harry arrives at the town and meets with the mayor, Rachel Wando, and her children, Graham and Lauren. Rachel offers to take Harry with them as they see her former mother-in-law, Ruth, who lives near a lake at the base of the volcano. While exploring, they find dead trees, dead squirrels, and even a young couple boiled to death by a hot spring named Twonset, heated up by the volcano's lava. Paul arrives with a USGS team that evening, and they set up base to monitor the volcano. Harry believes the disturbances to be signs of an impending eruption, but Paul disagrees and advises against giving a false alarm. Still, Harry tries to convince Rachel to prepare for a disaster, while developing a relationship with her and the children. A week passes, but although one of Harry's colleagues, Terry, is injured in an earthquake and avalanche in the summit crater, the volcano shows no signs of serious activity, and the USGS team begins preparing to leave. When Harry goes to say goodbye to Rachel, however, they discover the town's water supply has been contaminated with sulfur dioxide, and the next morning, seismic readings and gas levels rise dramatically. Finally convinced that the volcano will erupt, and with the National Guard unavailable until the next day, Paul gives Harry permission to put the town on alert. Before the group can evacuate the town, the eruption begins. In the ensuing chaos, Harry and Rachel go to retrieve the children, only to find they have gone to get Ruth, who refuses to leave her home. Just as they reach Ruth and the children, a lava flow engulfs Ruth's cabin and destroys the vehicles. The five flee across the lake in a motorboat, but the lake has become acidic due to sulfur-rich gases from the volcano, destroying the motor and eating away at the boat. Ruth jumps out of the boat to help it to shore, but sustains severe chemical burns and eventually dies from her injuries the next morning with her family and Harry at her side. The heat from the volcano melts the glaciers on the peak, forming a lahar that collapses a dam on the river leading into town. During a lull in the eruption, Harry and the Wandos take a ranger's truck and set off back to town, where the National Guard is helping evacuate the town. A bridge over the lahar fails, and while the USGS team makes it across, their van and Paul are lost to the flood. Meanwhile, Harry and the Wandos are forced to drive across a lava flow in their path, rescuing Ruth's dog, Roughy, along the way. When they arrive back in the deserted town, they find all escape routes gone. While retrieving a distress radiobeacon, Harry learns the volcano is due for a more violent second eruption. As he races for the town's abandoned mine, the volcano explodes, and they barely make it to the mine before the town is overrun and destroyed by pyroclastic flows. The USGS team, watching the eruption from afar, presume Harry dead. Harry leads the Wandos to Graham's former clubhouse in the mine, only to realize he left the beacon in the truck. When he goes back for it, the mine collapses, nearly crushing the truck and trapping him inside. Harry eventually manages to activate the beacon after much difficulty. A few days later, Terry notices the beacon has been activated, and the USGS dispatches search and rescue teams. Harry and the Wandos are freed from the mine, reunited with Harry's team, and airlifted out by helicopter. As the credits roll, the camera pans over the obliterated town before turning to the volcano, now reduced to a caldera. Principal photography began on May 6, 1996. The film was shot on location in Wallace, Idaho. Exterior shots of the Point Dume Post Office in Malibu, California were used as the USGS's David A. Johnston Cascades Volcano Observatory headquarters in Vancouver, Washington. The facility was named in honor of David A. Johnston, a young scientist who had precisely predicted the volatility of the May 18, 1980, Mount St. Helens eruption and perished during the event. A brief scene was shot inside the crater of Mount St. Helens. The scene involving the geological robot and the trapped scientist was shot inside the crater, as evidenced by a brief appearance by Mount Adams, a dormant 12,776-foot (3,894 m) peak 35 miles (56 km) east of Mount St. Helens, as the view focuses on the scientists. The scene itself was actually filmed on the tarmac of Van Nuys Airport, while the Mount Adams image was composited in later. Production was completed on August 31, 1996. Extensive special effects surrounding certain aspects of the film, such as the lava and pyroclastic flows, were created by Digital Domain, Banned from the Ranch Entertainment and CIS Hollywood. The computer-generated imagery was mostly coordinated and supervised by Patrick McClung, Roy Arbogast, Lori J. Nelson, Richard Stutsman and Dean Miller. Although the film uses considerable amounts of CGI, the volcanic ash in the film was created using cellulose insulation manufactured by Regal Industries in Crothersville, Indiana. Between visuals, miniatures, and animation, over 300 technicians were directly involved in the production aspects of the special effects. Despite the complexity of its visual effects, Dante's Peak was not nominated for an Academy Award for Best Visual Effects that year, as it faced stiff competition from The Lost World: Jurassic Park, Starship Troopers and Titanic, the eventual winner of the award. The original score was co-composed by John Frizzell and James Newton Howard. Howard wrote the main theme (heard during the opening titles) and a number of cues, while Frizzell wrote the bulk of the score. 30 minutes of the score was released by Varèse Sarabande; the short album length being due to high orchestra fees at the time of release. An expanded bootleg exists that contains almost the entire score. The contents of the CD release can also be found on the region 1 DVD, and Blu-ray on an alternate audio track during the 'Creating a Volcano' documentary. The "Main Titles" cue is also featured on Varèse's The Towering Inferno and Other Disaster Classics compilation album. The film was released on February 7, 1997 in 2,657 theatres. It debuted at #2 at the box office behind the special edition re-release of Star Wars with $18 million in its opening weekend. After 8 weeks in theatres, it went on to gross $67.1 million in the United States and $111.0 million overseas; it went on to earn $178 million worldwide, making it a box office success. Despite having wider financial success and being considerably more scientifically accurate than Volcano, Dante's Peak received negative reviews compared to its rival: Rotten Tomatoes gave the film a 24% rating based on 29 reviews, compared to a 48% rating from 42 reviews for Volcano. The consensus states: "Dante's Peak works when things are on fire, but everything else from dialogue to characters is scathingly bad." ^ a b c "Dante's Peak (1997) - Box Office Mojo". boxofficemojo.com. Retrieved 27 May 2015. ^ Topinka, Lyn (2009-12-08). "Establishing the David A. Johnston Cascades Volcano Observatory". United States Geological Survey. Retrieved 2010-04-03. ^ a b c "Dante's Peak (1997) - Cast and Credits - Yahoo! Movies". ^ "Weekend Box Office Results for February 7-9, 1997 - Box Office Mojo". boxofficemojo.com. Retrieved 27 May 2015. ^ "Dante's Peak". rottentomatoes.com. 7 February 1997. Retrieved 27 May 2015. ^ "Volcano". rottentomatoes.com. 25 April 1997. Retrieved 27 May 2015. Volcanoes in Historical and Popular Culture "In The Movies" - Dante's Peak at U.S. Geological Survey website.